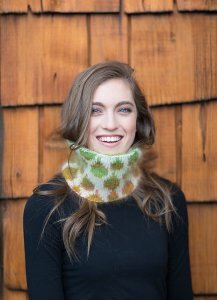 Taken from Stitch Mountain: "This cowl is double the fun and double the warmth knit in playful colors of Rowan Kidsilk Haze and Rowan Kidsilk Haze Stripe using a double knitting technique." Size US 5- 20" circular needle (or size needed to obtain gauge), stitch markers, and a tapestry needle are required but not included. Finished Measurements: 5.5" tall x 20" circumference after blocking. Gauge: 18 sts & 32 rnds over 4"
Colors Shown are Kidsilk Haze Stripe- #205 Circus & Kidsilk Haze #634 Cream.